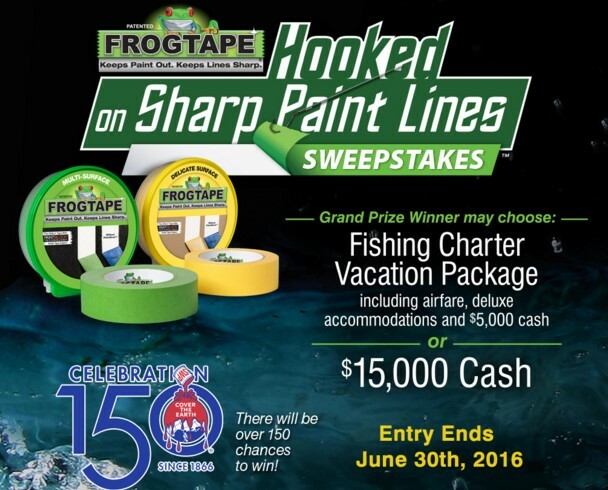 FrogTape is celebrating their 150th anniversary by offering you a chance to enter once to win a Fishing Charter Vacation with airfare, deluxe accomodations and $5000 CASH or $15,000 CASH! They'll also award 150 runner up winners with Visa Gift Cards worth $50 each so be sure to get your entry in. One (1) Grand Prize: WINNER’S CHOICE A) $10,000 USD vacation package of winner’s choice to a destination in the United States or Canada PLUS $5,000 USD in the form of a check or B) Winner may select $15,000 USD in the form of a check alternative to the travel prize.